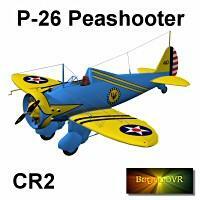 The Boeing P-26 Peashooter inter-war fighter. 1.27mb zip. zatanna (7 years ago) Inappropriate? oxode (7 years ago) Inappropriate? WOW! Thanks, I really like that You designe stuff that is special! Hey! It's been awhile since you've posted anything. Glad to see you back! Thanks for another neat model.